This is the first time the EU-financed development teams in SARTRE try their systems together outside the simulators. "We are very pleased to see that the various systems work so well together already the first time," says Erik Coelingh, engineering specialist at Volvo Cars. "After all, the systems come from seven SARTRE-member companies in four countries. The winter weather provided some extra testing of cameras and communication equipment." "This is a major milestone for this important European research programme," says Tom Robinson, SARTRE project coordinator, of Ricardo UK Ltd. "Platooning offers the prospect of improved road safety, better road space utilization, improved driver comfort on long journeys and reduced fuel consumption and hence CO2 emissions. With the combined skills of its participating companies, SARTRE is making tangible progress towards the realization of safe and effective road train technology". Vehicle platooning, as envisaged by the SARTRE project, is a convoy of vehicles where a professional driver in a lead vehicle drives a line of other vehicles. Each car measures the distance, speed and direction and adjusts to the car in front. All vehicles are totally detached and can leave the procession at any time. But once in the platoon, drivers can relax and do other things while the platoon proceeds towards its long haul destination. The tests carried out included a lead vehicle and single following car. The steering wheel of the following car moves by itself as the vehicle smoothly follows the lead truck around the country road test track. The driver is able to drink coffee or read a paper, using neither hand nor foot to operate his vehicle. Platooning is designed to improve a number of things: Firstly road safety, since it minimises the human factor that is the cause of at least 80 percent of the road accidents. Secondly, it saves fuel consumption and thus CO2 emissions with up to 20 percent. It is also convenient for the driver because it frees up time for other matters than driving. And since the vehicles will travel in highway speed with only a few meters gap, platooning may also relieve traffic congestion. The technology development is well underway and can most likely go into production in a few years time. What may take substantially longer are the public acceptance and the legislation where 25 EU governments must pass similar laws. The SARTRE project stands for Safe Road Trains for the Environment. Part-funded by the European Commission under the Framework 7 programme, SARTRE is led by Ricardo UK Ltd and comprises collaboration between the following additional participating companies: Idiada and Robotiker-Tecnalia of Spain, Institut für Kraftfahrwesen Aachen (IKA) of Germany, and SP Technical Research Institute of Sweden, Volvo Car Corporation and Volvo Technology of Sweden. SARTRE aims to encourage a step change in personal transport usage through the development of safe environmental road trains (platoons). Systems are being developed in prototype form that will facilitate the safe adoption of road trains on un-modified public highways with full interaction with non-platoon vehicles. SP Technical Research Institute of Sweden is part of the SP Group, consisting of the parent company and its subsidiaries CBI, Glafo, SIK, SMP, YKI and JTI. It constitutes a substantial group of institutes for research, innovation and sustainable development of industry and society. The Group covers a wide technical range, with laboratory resources that are fully up to national and international standards. A staff of about 1 000, of whom half are university trained and about 250 have research scientist training, constitute an important knowledge resource. Since November 2009, the SP Group has been wholly owned by the state holding company, RISE Holding AB. Ricardo plc is a leading independent technology provider and strategic consultant to the world's transportation sector and clean energy industries. The company's engineering expertise ranges from vehicle systems integration, controls, electronics and software development, to the latest driveline and transmission systems and gasoline, diesel, hybrid and fuel cell power train technologies, as well as wind energy and tidal power systems. A public company listed on the London Stock Exchange, Ricardo plc posted sales of £162.8 million in financial year 2010. Ricardo is participating in the SARTRE project through its UK business, Ricardo UK Ltd. For more information, visit www.ricardo.com. Volvo Technology Corporation is a Business Unit of the Volvo Group, which is one of the world's leading manufacturers of commercial transport solutions providing products such as trucks, buses, construction equipment, drive systems for marine and industrial applications as well as aircraft engine components. Founded in 1927, Volvo today has about 100,000 employees, production in 19 countries and operates on more than 180 markets. Volvo Technology Corporation is an innovation company that on contract basis invents researches, develops and integrates new product and business concepts and technology for hard as well as soft products within the transport and vehicle industry. Volvo Technology's primary customers are the Volvo Group Business Areas & Units. In addition, Volvo Technology participates in national and international projects in certain strategic areas, organised in common research programmes. For more information see www.tech.volvo.com. Applus+ IDIADA, as a global partner to the automotive industry, provides complete solutions for automotive development projects worldwide. Applus+ IDIADA's Technical Centre is located 70 km south of Barcelona (Spain), having subsidiaries and branch offices in 16 European and Asian countries with a total work force of around 1000 employees. The core services Applus+ IDIADA provides are: Engineering, Proving Ground and Homologation. Main fields of engineering activity are power train, emissions, noise & vibration, vehicle dynamics, braking systems, fatigue & durability and passive safety. Applus+ IDIADA's proving ground is recognised as one of the best facilities in the world, and is renowned for the quality of its costumer service. As a multi-user facility, safety and confidentiality are of the highest priority. Weather conditions make this facility the first choice regardless of the type of testing. The Institut für Kraftfahrzeuge of the RWTH Aachen University (ika) with its centennial history is engaged in education and in industry-orientated research on vehicles - e.g. cars, commercial vehicles, busses and motorcycles - as well as neighbouring issues such as traffic and environmental conditions (noise, exhaust gas, etc.). ika is headed by Univ.-Prof. Dr.- Ing. Lutz Eckstein. In 2009 ika had more than 200 employees. IKA increasingly links research projects with development tasks that have to be financed by third-party funding. ika´s activities are tailored to industrial demands and comprise the departments: Chassis - Body - Drive train - Acoustics - Electronics - Driver Assistance - Strategy and Process Development. The Driver Assistance department focuses on the development and assessment of driver assistance systems. Since the first introduction of advanced driver assistant systems (ADAS) ika has been one of the leading test facilities for independent tests and certifications of the system's components and overall applications. For more information please see www.ika.rwth-aachen.de. Volvo Car Corporation is one of the car industry's strongest brands, with a long and proud history of world-leading innovations. Volvo sells around 400.000 cars per year in about 120 countries and comprising some 2,000 sales outlets and service workshops around the world. 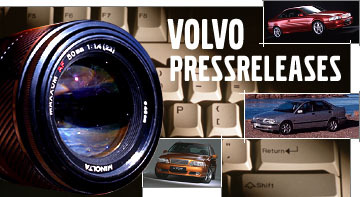 Volvo Car Corporation's headquarter and other corporate functions are based in Gothenburg, Sweden.